Art is intended to serve the public. The further an artist progresses in his career, the bigger and more diverse the audience he serves. It is important that artists place themselves in the shoes of the public. To be able to serve all different expectations a strong foundation within a robust house of professional growth is needed. Earlier we drew upon the parallels with start-ups in our article ‘The 21st century of Patronage: Angel Investing in Artists ‘. Now we distil insight from the world of excellence deriving inspiration from professional sports, business management and innovation management. It is the combination and connection to see the fit from one sector or industry to another, that gives food for thought. 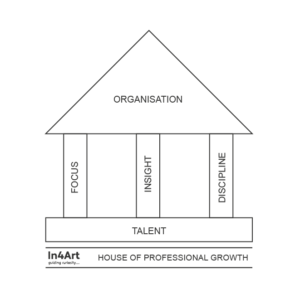 The House of Professional Growth is a metaphor for the 5 basic ingredients within a professional artistic career. Why sports? In top sports, one is seeking excellence in output and at the same time is serving the public by creating a fan base and being a motivator and inspirator for generations to come. Art has the same take-off. Good art can bring comfort, hope, inspiration, joy, perspective or insight to those who are exposed to it. 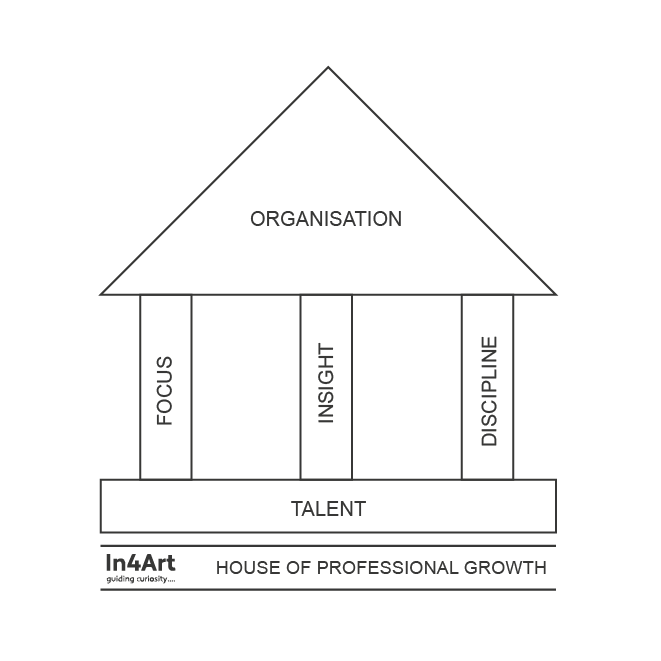 The House of Professional Growth takes around 10 years to build from a vulnerable foundation (talent) to a robust roof holding the house together (organisation). Within the first decade of an artist’s professional career, the pillars are built (specialisation, insight, discipline) to support the roof. All five elements are needed to reach the top and are to a great extend within the artists control. The first is given by birth. The second until fourth can be trained and form your cornerstone pillars. The fifth will arrange the finishing touch. If one of the blocks is out of balance, the roof will come down. This happens to emerging artists on a structural basis, because artists are pushed to perform on the highest level before getting time to create the house. In the book “Wie bepaalt de waarde van kunst“ Baars, a Dutch art dealer and writer, shows examples on why promising Dutch artists failed to reach the top. He gives examples claiming a lack of depth in one artists practice or leaning too much on technique while missing out relevance in another. The artists failed because they were exposed to high expectations from the public (being gallerists, collectors, curators, critics and other viewers) before they had the opportunity to fully build their House of Professional Growth. The storm came before the roof was fixed, so to say. The period of professional growth covers the formative years of an artists practice (mostly between the ages of 25 and 35). During this period, the focus should lie on experimentation, failing, pivoting and retrying. A period of failing forward. A concept derived from John C. Maxwell’s book on how to turn mistakes into stepping stones for success. Maxwell explains the main difference between average people and achieving people. The key lies in the ability to respond to failure. Fail fast and forward: the breeding ground to learn and excel on the long term. Any house is built upon its foundation. The starting point of development. The basic ingredient for the foundation is Talent, filled with passion and ambition. To quote Pepijn Lijnders, talent developer at Liverpool FC: ’there is one factor that decides 99 percent of development – love for the game. Because if you don’t love it, you will never work hard enough to become really great’. But what is this love? It is about enjoying one’s talent so much that one wants to work on developing it every day. And this is needed, considering the situation of oversupply in the art market. There is simply too much art for the number of buyers in the market. Therefore, the foundation of the house is the love for art and the talent to do something with it. On top of the foundation rest the pillars, three trainable elements that you can choose to develop: Focus, Insight and Discipline. Focus is the style resulting from the speciliasation the artist has chosen. This leads to one’s unique language and makes it recognizable. This specialisation can be chosen from a broad range of possibilities: it could be a material, a method, a concept or a tool. Whatever it is, once a specialisation is chosen the manifestations can be endless. By daring to choose and creating focus, one can learn from failures and continuously improve one’s practice. This will lead to better executed bodies of work and a recognizable pillar to fall back on in difficult periods. Gathering insight is the element that will give an artist the capability to surprise and give relevance to the work. Have you ever noticed how aware famous artists are about what happened before them (historically), what happens around them (peers) and what could happen in front of them (in the future)? Studying peers, following trends, digesting patterns; they are trainable elements that will bring insight and the ability to react upon unexpected situations. The third trainable element is discipline. To build a story of success, one needs to become an outlier. Stand out of the crowd and be noticed. This requires a whole lot of practice. Discipline, in other words, is following the “10.000-Hour Rule” from Malcolm Gladwell. The rule states that greatness requires enormous time, regardless of how talented one is. For example, The Beatles performed over 1.200 times live (3 times a day, 7 days a week) between 1960 and 1964, amassing more than 10.000 hours of playing time before their breakthrough. The elements placed in the pillars are there for two main reasons: they are interdependent and they are trainable. They can be built upon the foundation (talent) which is something one is born with. Once the pillars are strong enough, an artist is close to completing the period of professional growth. It is time to close the roof with a strong organisation. An increasing number of gallerists, curators and collectors will be raising their expecting. They expect the artist to perform, on a high level, consistently, producing surprising yet recognizable new works of art on a structural basis bearing minimal mistakes. If an artist wants to be able to perform on this level with this kind of pressure, it is incredibly important that he or she understands the effect of ‘preventing problems’ as introduced by football legend Johan Cruijff. During his years in the US in the 1970’s he met Andy Dolich, a sports executive who managed successful teams in football, baseball and basketball based on the philosophy that everything within control should be focussed on preventing organisational problems that could influence the team’s performance. In many ways, the artist is by now no longer the individual who trains in his or her studio to be in the spotlight one day; now one is part of a team in which all parties need to excel to achieve success. There are assistants in the studio to instruct, collectors and curators in the field to nurture, gallerists and agents to collaborate with. The key to run this artistic practice successfully lies in the organisation of priorities and making the right choices structurally. At In4Art we believe that young artists going through the years of professional growth need support. But above anything, they need an environment that allows them to learn, grow, fail and ultimately succeed. This environment should be free of the pressures from established galleries, ambitious curators or top collectors. Their time will come. Let the artist first set up the five basic ingredients and built a home. It is this incubation period that becomes the talent factory delivering the world class artists of the future.